John was first licensed as WV2BQJ in 1958 while living in Syracuse, NY. 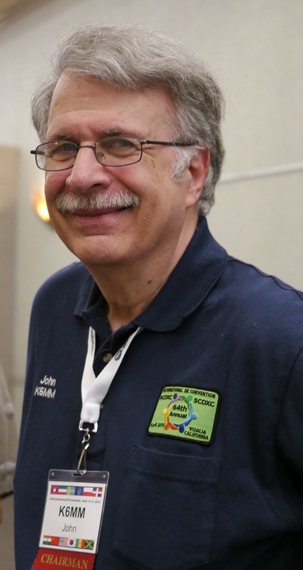 In 1976, John’s career took him to Silicon Valley, where he reconnected with amateur radio in the late 90s. For the last decade, John has focused heavily on DXing, contesting, and recruiting new operators into the hobby. His DXCC total stands at 330 confirmed. He holds 8-Band DXCC, and is working on completing 160M for the 9th band. His article entitled "The No Excuses 160M Vertical" won the cover plaque award for the June 2009 issue of QST. John was a member o the PJ7E Sint Maarten DXpedition; a member of the K9W Wake Atoll DXpedition; and was the pilot and webmaster for both the NH8S Swains Island and C82DX Mozambique DXpeditions. John is a Past-President of the Northern California Contest Club (NCCC), a current Vice-President of the Northern California DX Club (NCDXC), and a Director of the Northern California DX Foundation (NCDXF). He is also a founding member of the CW Operators’ Club, a member of the editorial staff of the National Contest Journal, and a proud member of ARRL, REDXA, MLDXCC, and PAARA. John co-chaired the 2011 and 2013 International DX Convention meetings in Visalia, CA, and will do so again in 2015.